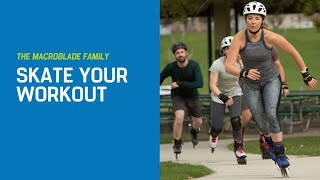 For any level of long-distance runner, inline skating is a way to give the body a break while continuing to build cardio and strength abilities, plus providing the additional support a runner needs to minimize injury. Rollerblade® offers a variety of inline skates to accommodate differing levels of ability and fitness goals. Inline skating primarily works the muscles of the lower body: the quadriceps (front of thighs), glutes (rear end) adductors and abductors of thigh (inner and outer thigh/hip), and the lower leg muscles (calves and shins). Postural muscles (abs and back extensors) get a workout too, by stabilizing the body. For long-distance runners on a training schedule, days designated for “long, slow recovery run” can be replaced by a long skate, which provides a cardiovascular workout and can also invigorate different muscle groups than running. A shorter skate (three to five miles) can be incorporated into a cross-training day amidst activities like weights or Yoga. The key for runners to get the most benefit from inline skating is proper form. For someone new to the sport, it’s worth taking the time to learn the basics of moving, stopping and turning on inline skates. This means practicing various drills to enhance technique and to condition muscles to move through their full range of motion. Repeated drills will strengthen both form and muscles. Inline skates are shoulder width apart; ankles, knees, and hips slightly flexed; shoulders comfortably forward. Arms and hands should be within the field of view. Stop moving feet and bring both skates beneath the body with knees flexed and shoulders slightly in front of the hips. Depending on ability, arms can be to the sides of the body or held out in front within the field of view. Purpose: Basic starting position of all inline skating skills. Begin in a two-foot glide. Keeping the knees flexed, scissor one skate in front of the body. The heel of the front skate should be aligned with the toe of the back. Hold this position for a count of 5. Repeat with the opposite leg forward. Begin with the Two-Foot Glide. Keeping the upper body still, shift the weight to the left leg. Lift the right skate, aligning the toe of the right skate with the heel of the left. Purpose: Improves balance and agility. With a bend in the knees, push down through the heels of the skates while turning the toes slightly out to the sides. The wheels should roll to the inside edge. Continue the movement by turning the toes slightly inward while rising up in the knees, bringing the feet back underneath the body and into a short Two-Foot Glide. Continue moving by repeating the motion so that the swizzles are “linked” and the glide time between swizzles is shortened. Purpose: Builds leg strength and power. Begin by shifting the weight over to the left skate and place both hands on the knee (keeping the hands on the knee throughout will help to keep the body in correct alignment) and the weight over the support of skating side. The wheels are on the center “edge”. Pressing through the heel of the right skate, extend the leg out to the side as far as comfortable. The wheels of the right skate will be on the inside edge. Regroup the skates by bringing the right leg back underneath the body. Continue to move forward by linking the One-Foot Swizzles. Focus should be on fully extending the swizzling leg and regrouping the skates beneath the body. Purpose: Builds strength in the quadriceps. Helps to lengthen skating stride. Improves balance. Alternating Swizzles can also be performed by moving in a straight line and alternating One-Foot Swizzles. This exercise will be helpful for turning. 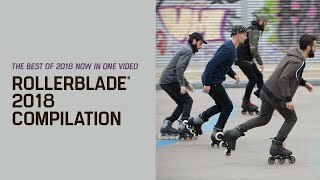 Rollerblade® suggested inline skates for skate to run training: Macroblade 84, Macroblade 90, or Macroblade 100. The Macroblade family offers perfect support and balance for the aspiring athlete in training. If want to keep the workout at an easy pace go for the Macroblade 84. The 84mm wheels keep you low the ground and provide a moderate top speed potential. If you are inbetween the need for speed and and easy pace, go for the Macroblade 90. The 90mm wheel size is the ideal wheel size for most that want to train. If you’re the type that likes to go as fast as possible while training, go for the Macroblade 100. The 100mm Supreme wheels will have you ripping along the local bike path!